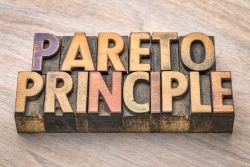 The Pareto Principle was discovered by a 19th century Italian economist and sociologist named Vilfredo Pareto (1848 - 1923). When he was researching the distribution of wealth in society, he found that 80% of the wealth was held by 20% of the population. Even more interesting was that he was able to see similar distributions outside of economics. For example, in his own garden he found that 80% of his peas were produced by only 20% of the peapods he had planted. Because of this particular distribution, this principle is also known as the 80/20 Rule and the Pareto Distribution. It can be generalized with the following statement. "80% of the outputs result from 20% of the inputs." The chart lists the inputs along the horizontal axis in descending order of output frequency. The left vertical axis measures the number or frequency of the output for each input and is charted using a bar graph. The right vertical axis measures the cumulative percentage of the outputs and is charted using a line graph. 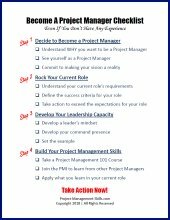 In the sample Pareto diagram above, you can see that there are seven categories of Project Issues. It is evident that most of the issues, 42% to be exact, are related to "Installation." 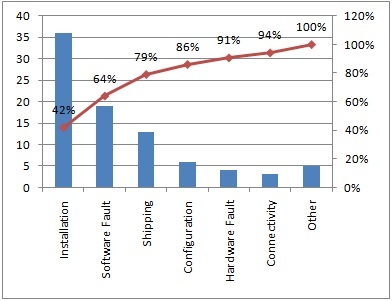 It is also very easy to see that three categories account for 79% of the issues: Installation, Software Faults, and Shipping. Based on this Pareto analysis, if you focused your efforts on addressing just the Installation issues, you would have the potential to cut your total issues by more than 40%! As you can see, Pareto analysis is a great tool to identify the critical inputs to focus on that will give you the best results. Change the Measurement Scale: Use the same inputs, but measure the outputs differently. For example, one chart can measure frequency and another chart can measure cost. Using a Pareto chart to analyze problems in your project will allow you to focus your efforts on the ones that offer the greatest potential for improvement. What is quality assurance? Quality assurance principles and definition explained for project environments.